Power flat is proving to be strong competition as the go-to shoe for female executives who have had enough of sore feet while trying to keep up with their male counterparts. Although power heels create height, lengthen the legs and arch the foot just so, they also slow women down. 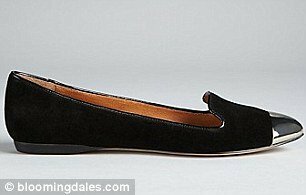 So flats that are sleek enough to be dress shoes are now taking women from the boardroom to the bar with the same attention and authority. Women, who often spend the day changing in and out of uncomfortable power heels, usually lag behind the fast-paced strides of male colleagues, teetering over cobble-stoned streets and dodging sidewalk cracks. They have long lugged around over-size handbags just to carry a pair of walking shoes, so they can awkwardly change into stilettos for their next big meeting. Or, they simply spend enormous amounts of wasted income on cabs thanks to sore, pinched feet from four-inch heels. However, this season flats are commanding attention just as much as the highest heel, a sign perhaps that a woman’s average day is becoming more demanding, faster and busier than ever – jugglinglong days at work, families, trips to the gym and active social lives. Luisa De Paula, Buying & Merchandising Director of My-Wardrobe.com, explained: “Today’s woman has an ever busier lifestyle. Pointy toes, metal toe caps and embellishments like spikes, studs and gemstones; as well as strong colors, materials like snakeskin, tweed and patent leather are some of the details that give these flats their powerful edge. While masculine Oxfords were all over the fall collections, pointy-toed flats and smoking slippers are on the agenda for next spring – and none of them hold the quintessential casual image that often comes with flat shoes – such as ballet flats. At both Marc Jacobs and Giorgio Armani, flats were paired with tailored suits and eveningwear. Power flats are an especially welcome alternative for the many executives who are unable to wear heels for health reasons. And working women have taken note. “We have seen a significant increase in sales of flat shoes against last season and what we term the <<statement flat>>,” said Luisa De Paula. But how to wear the new angular flat? Christina Binkley advised: “Think of the way Carla Bruni-Sarkozy has worn them since marrying her much-shorter husband, the former president of France.